It may be only a matter of time before urban dwellers can hail a self-driving taxi, so researchers at the Department of Energy's Lawrence Berkeley National Laboratory (Berkeley Lab) and UC Berkeley decided to analyze the cost, energy, and environmental implications of a fleet of self-driving electric vehicles operating in Manhattan. Using models they built and data from more than 10 million taxi trips in New York City, they found that shared automated electric vehicles, or SAEVs, could get the job done at a lower cost – by an order of magnitude – than present-day taxis while also reducing greenhouse gas emissions and energy consumption. 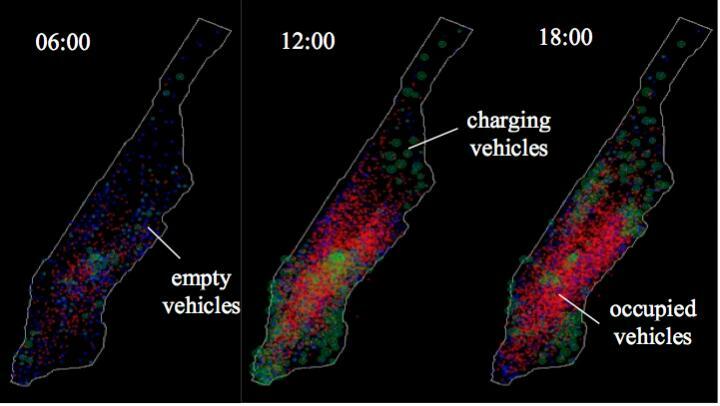 What's more, they found that "range anxiety" is moot because smaller cars with a smaller battery range were sufficient to complete the trips, although more charging stations would be needed. Their study, "Cost, Energy, and Environmental Impact of Automated Electric Taxi Fleets in Manhattan," was published recently in the journal Environmental Science & Technology. The corresponding author is Gordon Bauer of UC Berkeley's Energy and Resources Group, and co-authors are Jeffery Greenblatt and Brian Gerke of Berkeley Lab. "The EV industry is focusing on the personal car market, trying to make the range as large as possible," said Greenblatt. "The standard now is 200 miles. We suspected you wouldn't need as much for taxis. We found plenty of times during the day when a portion of taxis could slip off to recharge, even if just for a few minutes. This greatly reduces the need to have a big battery and therefore drives down cost. It is dependent on having a fairly dense charging network." "Manhattan currently has about 500 chargers for public use, which include Tesla chargers," Bauer said. "We found that we would need to at least triple that capacity." Greenblatt points out that there are still many barriers to the wider penetration of personal EV ownership, including high cost and limited range. "By switching to a shared fleet that's automated, you can provide electric service to people essentially now," he said. He notes that shared vehicles are best suited for dense, urban environments: "We're not saying these shared vehicles will be the right thing for road trips, but for the vast majority of urban trips, people drive short distances," Greenblatt said. The researchers said they were motivated to study this topic because they think it will be "the next big thing" in transportation, Greenblatt said. "For a long time, personal transportation seemed like the hardest problem to solve," Gerke said. "Now suddenly it seems like there's an obvious path to achieving it, which is the electrification of vehicles coupled with changing the way we get around from private vehicle ownership to shared approaches. Shared approaches are starting to work in urban areas." Gerke previously researched lighting efficiency, and was surprised by how quickly the market switched from incandescent to LED bulbs. "It was a better product and it was cheaper overall," he said. "When you have those together, people adopt it really fast. I suspect there will be a similar transformation that will occur in the transportation sector in the next decade – it will occur faster than people think." The study was supported by DOE's Vehicle Technologies Office (VTO) as part of its SMART Mobility Lab Consortium, managed by VTO's Energy Efficient Mobility Systems Program.